The Rosetta mission caught this plume on camera on Comet 67P/Churyumov-Gerasimenko in July 2016. Luckily for scientists, the spacecraft also sampled material from the outburst, providing more information about its origin story. It looks like Rosetta's comet was a bit of a tooter. A fart from the comet — which scientists called "a bright plume of dust blowing away … like a fountain" — likely originated from the comet's insides, maybe from ancient gas vents or unseen ice. While other plumes have been observed in the past, this outburst was particularly useful because Rosetta snagged a sample of the material, according to the statement. It also got high-resolution pictures of the explosion location, which was a wall 10 meters (33 feet) high around a circular dip on the surface. "This plume was really special," Agarwal added. "We have great data from five different instruments on how the surface changed and on the ejected material because Rosetta was, by chance, flying through the plume and looking at the right part of the surface when it happened. Rosetta hasn't provided such detailed and comprehensive coverage of an event like this before." Based on the amount of dust thrown into space, scientists theorized that something beneath the surface caused the rumble. But exactly what remains a mystery. Leading theories include pressurized gas bubbles inside underground cavities, or a trove of ice that burst apart when the sunlight hit it. Rosetta scientists continue to look at data produced by the mission, and to combine the information with computer simulations and laboratory examinations, to learn more about what was really going on. Top left: A model of Comet 67P highlighting its Imhotep region, where a dust plume erupted on July 3, 2016. Bottom left: An image of comet 67P by the Rosetta spacecraft showing the area. Top right: An image of the outburst captured by Rosetta, with two other images of the region for comparison below. 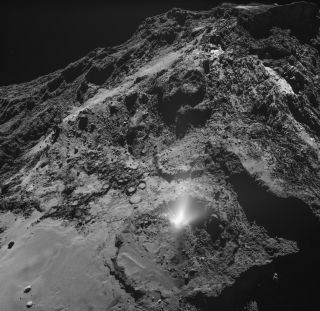 "One of Rosetta's major goals was to understand how a comet works. For example, how does its gaseous envelope form and change over time?" said Matt Taylor, ESA's Rosetta project scientist, in the same statement. "Outbursts are interesting because of this, but we weren't able to predict when or where they would occur — we had to be lucky to capture them," he added. "Having full, multi-instrument coverage of an outburst like this, and its effect on the surface, is really valuable for revealing how these events are driven." A paper based on the research was published in the Monthly Notices of the Royal Astronomical Society.